The Global Fusion Project is an exotic hybrid born from the creative collaboration of some of Chicago’s leading practitioners of non-Western musical forms and the classically-trained members of the New Millennium Orchestra under the baton of Maestro Francesco Milioto. Assembled by MFA program director Andy Hill, the ensemble was formed as a means of teaching aspiring film composers enrolled in the graduate program in Music Composition for the Screen at Columbia College Chicago how to utilize non-Western tonal systems more authentically than their Hollywood predecessors, who had often relied on ‘ethnic’ cliché in the scoring of films set in unfamiliar cultures and climates. The New Millennium Orchestra (NMO) made its debut on Earth Day, 2005, in a concert aptly titled “The Concert for Recycling.” The performance featured traditional renditions of Handel’s Water Music and Beethoven’s Symphony #4, which were then remixed (or rather, “recycled”) live by DJ jRick. Through this inaugural concert, the NMO successfully realized its mission of collaborating with diverse artists, merging classical and pop art-forms, and attracting a diverse audience ranging in age from 10 to 80. Under the direction of conductor, Francesco Milioto, the NMO has defined its mission partly in response to common challenges found within the traditional symphony orchestra, including repetitive programming, a lack of professional growth, and an aging audience. Committed to the high standards of classical music performance, the NMO is also inspired by Chicago’s diverse cultural landscape and by ongoing technological advancements to create inventive multi-genre electronic and classical fusion concerts. Additionally, the NMO works to advocate for issues of sustainability, performing for events that raise awareness on green issues, energy, and the environment. Ultimately, the NMO’s unified vision is to emphasize music’s relevance and positive impact on society. Lyon Leifer is recognized in Europe, the Americas, China and India as a master of the bansuri, the keyless flute associated in Indian lore with the god Krishna. Kim Sopata has studied the Egyptian nay, the emblematic end-blown reed flute of the Islamic world, since 2003. Habibullah Wardak is one of the world’s most accomplished practitioners of the Afghani national instrument known as the rubab, a venerable member of the lute family. 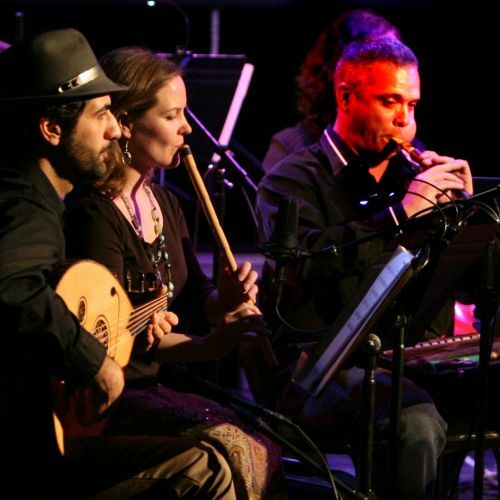 Chicago native Ronnie Malley is a multi-instrumentalist whose contribution to the ensemble is the indispensable Middle Eastern stringed instrument known as the oud, the father of the Western lute. A recognized virtuoso on the ancient Chinese spike fiddle known as the erhu, Betti Xiang has performed in distinguished venues all over the United States, where she has lived since 1996.